Hosted by klaatu on 2011-11-08 is flagged as Clean and is released under a CC-BY-SA license. Pat Volkerding of Slackware Linux chats with Klaatu and whomever happens to wander by (Maco, Vincent Batts, Chad Wallenberg, and others) at the SELF afterparty. Warning: this is not a proper interview, just 40 minutes of aimless and fairly noisy chit chat at a party. So it's probably not for everyone, although if you're a Slackware fan then it might be of some interest. into new age spirituality e.g. McKenna, incense, etc. I'm not making this exception because it was "better", I would find it impossible to make such a call. The HPR community produces a massive amount of content and I have listened to every single one at least once. There has not been a single HPR show that I have not enjoyed and learned from. Nor is it that it was submitted by Klaatu as given that he has submitted 12 1/2% of all shows, I would have written this long before now. 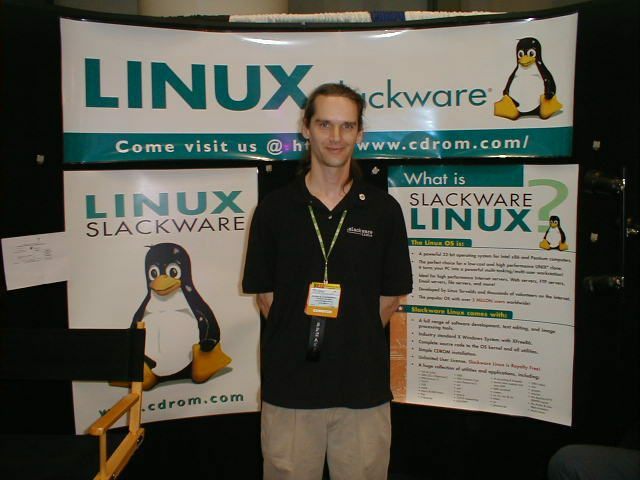 Sure today's 'topic' was special - a interview with Patrick Volkerding the man behind SlackWare, the longest continually developed Linux distribution - but we've had other interviews with people of note before. The reason for this deviation is simply because it embodies the qualities that I feel define Hacker Public Radio. It's about taking a topic and exploring it, looking at all sides, exposing otherwise hidden and unknown facts, it's about events, it's about community, it's about people, it's about technology, it's about music, it's about history, it'a about life, it's about questioning - everything - our very existence - space time - ancient cultures. In short it's about "Any topic that is of interest to Hackers"
If you have never listened to a HPR then this is surely the best sample of what you are likely to find. Sure it arrived just in time to fill an otherwise empty slot, the audio isn't perfect, it might not follow a script, random people wander in and out, there may be tangents from the topic at hand but if you can open your ears to listen you'll hear the passion of the community, our community. Then maybe, just maybe, you too will be inspired to share your unique point of view with us. I am a long time linux user who started with Red Hat 5.1 and has worked consistently with Red Hat and Debian-based distros ever since. I have never really given Slackware much thought. I noticed in the photo above that the URL for slackware is given as http://www.cdrom.com. When entered in my browser, I get a site offering windows applications for download. Just thought I should warn people that the correct URL for slackware is slackware.com . Is this an old photo perhaps? really enjoyed this podcast, been following slackware since about 9.1 (2004~), while i dont actively use the distribution, ive always enjoyed reading patricks thoughts on software release cycles, and being as stable as possible. when this podcast strayed from the technical, it took us in a great new unexpected direction (who thought patrick was into mckenna?). really enjoyed, would love to hear more podcasts in the same vein.